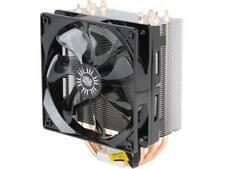 Cooler Master 2U Low Profile Copper Heat Sink for Socket A / Socket 370. Socket Type: Socket 370 / Socket A / Socket 7 / Socket 586. Skived Fins design, High passive cooling performance. The Master Fan MF200R RGB provides a specific air cooling solution ideally for chassis in-take fans. It is certified compatible with Asus Auro, AS Rock RGB, Gigabyte Fusion, and MSI RGB. The MF200 RGB incorporates a mix of noise reduction technology, sound absorbing rubber along with a helicopter/jet blade design giving you static air pressure without sacrificing airflow. 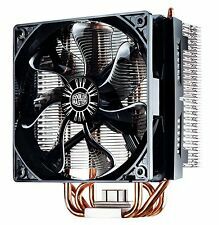 Cooler Master Standard CPU Cooler with 70mm Fan DK9-7E52A. MasterFan Pro RGB series provides a specific air cooling solution ideally for CPU coolers and chassis in-take fans. The MasterFan Pro RGB series is fitted with multiple layers of our exclusive noise reduction technologies and a perfect blend of fan blade design that put together work in harmony to cool your entire case and its components in silence. Wide-range PWM fan with unique wave-shaped blade design for excellent airflow. AM4 bracket available through Cooler Master USA. Fan Speed: 600 – 2,000 RPM (PWM) ± 10%. 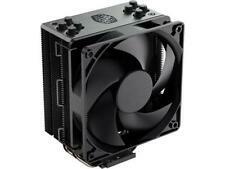 Supports an optional 2nd 120mm fan to increase cooling performance. Silent operation under at 17dBA only. Push pin design for easy installation. Cooler Master Hyper 212 Plus. 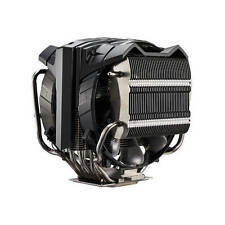 Hyper RR-212E-20PK-R2 LED CPU Cooler with PWM Fan, Four Direct Contact Heat Pipe. Condition is New. Shipped with USPS Priority Mail. New In Open Box. I opened box but never removed heatsibk from packing or instslled. Auction includes all original accessories and paperwork. 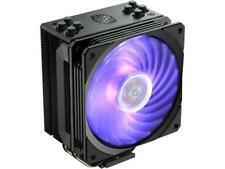 Item is Cooler Master Hyper 212 EVO - CPU Cooler with 120mm PWM Fan. Shipped with USPS Priority Mail. Used Cooler Master Hyper 212 taken from working system I owned personally. Includes the following two (2) fans. 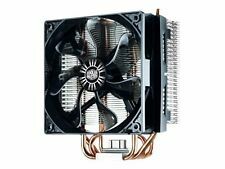 Cooler Master DP55G11A (Lot of 11) 5500 RPM, CPU Cooling Fans. New in Boxes! 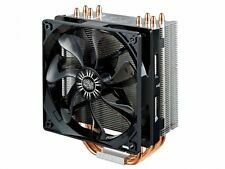 Cooler Master DP55G11A (Lot of 11). CPU Cooling Fans. 5500 RPM, 11.3 cfm, 50mm x 50mm, 12 VDC. New in Boxes! Cooling Fan (Narrow ILM Type Mounting) 2U LGA 2011 Socket R / M4 Cooler for Core i7-5930K, i7-5820K, Haswell-E 6-Core and i7-5930X 8-Core. Condition is Used. Removed from my PC when I upgraded the MoBo and CPU. Still works and is quiet. I dismantled and parted out the old PC this was in a while ago, but haven't found a use for this heatsink and it's just sitting around unused. A used Cooler Master V8 (RR-UV8-XBU1-GP) with LGA1366 mounting hardware. As pictured. We have a few so the serial number of the unit you receive may not match what is shown in our pictures. We have a few of these and have pictured one in average condition. It is sealed.